Co-op bots Atlas and P-body, in Portal 2. These next tests require cooperation. Consequently, they have never been solved by a human. That's where you come in. You don't know pride; you don't know fear. You don't know anything. You'll be perfect. The Cooperative Testing Initiative, or simply co-op, is a multi-player gamemode and campaign in Portal 2 whereby two players can join up and take part in test courses built specifically for cooperative testing. 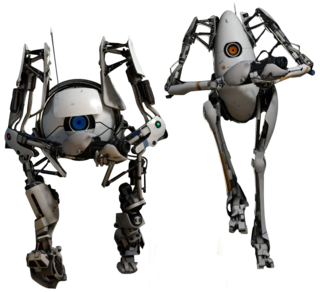 Players take the form of two robot test subjects built by GLaDOS, Atlas; the short and round blue bot, P-body; the tall and pea-shaped orange bot that looks like a turret with arms and legs. Each bot comes equipped with their own Handheld Portal Device with separate portal colors. The portals are capable of maintaining the flow of things, even if it enters a partner's portal, which is essential during some test chambers. There are five official testing courses, each with a number of test chambers within, which will test both the robots' ability to solve the different puzzles as they progress. Each chamber becomes much harder than the last, with the final test taking place outside the official Aperture testing facilities. In these tests, the bots are then put to the test, so to speak, and must use every bit of knowledge earned about the previous tests in the final one. For the last chambers of each courses, excluding the fifth, the bots are instructed by GLaDOS to go out and locate a certain disk to be inserted into a DVD player found at the end of the course. Once found and inserted within the device, the players are given a few lines from GLaDOS before she triggers a self-destruct sequence on the duo. This is the only means of retrieving them back to the Hub. During the testing, GLaDOS will periodically chime in and say a few choice words, either to bemoan the bots' progress or point out their tiny flaws. She even goes beyond to try and break their partnership by pointing fingers at one or the other. If either both or one of the bots' stands within range of GLaDOS' monitoring cameras and perform a gesture, it will elicit her response, depending on the gesture performed. In this campaign, the bots will be notified that their partner has been destroyed and exactly where it did. The destroyed bot will be easily rebuilt seconds later in a chute from the Reassembly Machine. The gamemode gives an infinite amount of lives, and GLaDOS will comment on every death that occurs with dry humor or irritability. As the bots progress, they will cross checkpoints that lead into the next part of the test chamber. Checkpoints allow the bot that died to respawn at the checkpoint for shorter travel time to the next testing chamber. This is one of the first courses available to the player upon entering the Hub, the others remaining locked until the other courses are completed. In this course, the players are given basic tests that emphasize the use of teamwork through portals and pinging, which is a function that allows players to communicate even without text or even through voice. Pings come in a variety of forms, from a simple "Look" ping, to a "Timer" ping that can be used to coordinate timed events effectively. After completing Course One, this course will unlock for players to continue testing. This chamber utilizes the effects portals have when an object has both mass and velocity as it enters the portal, meaning the players must utilize both in order to pass this course. This course opens up upon completion of Course Two. In this course, the players must make use of the Light Bridges to both navigate chambers and act as a wall for other chambers as a defense mechanism or a creative way of stopping something from hurtling into a water hazard. This course unlocks upon completion of Course Three. During this course, the player will have to make use of both Light Bridges and Excursion Funnels in order to complete these chambers. It will employ elements from the previous courses as well, making it much more difficult as the players progress. This is the final course that unlocks after the completion of Course Four. Upon entering, GLaDOS will chime in and explain the significance of Atlas and P-Body's testing and what their true purpose is. The players are then dropped into the defunct Aperture testing spheres encountered during single player, and must make use of all elements from the previous chambers along with the Gels that are found in the course. The final course is very difficult, requiring both players to act as a true team. The last chamber is halted by a large vault door, which holds the frozen humans inside. Both players must perform any gesture to ultimately unlock the door. Set after the conclusion of the Mobility Gels course, GLaDOS has reassembled the bots for testing again and claims that it has been millions of years since they were last reassembled. As the testing progresses, the bots are able to observe the defunct surroundings of the Enrichment Center, which GLaDOS assures them as part of an "art exhibit". Further on in the course, players will be sent to a Robot Assembly Annex station to repair their own reassembly machines as GLaDOS finally makes it clear that it has only been a week since the Mobility Gels course and that she needs their help in restoring her control over the facility as something is overriding her controls. At the end of the course, both players are sent out of the testing area to resolve the problem in a control room housing a prototype chassis of the central core. Interestingly, the sixth course was initially going to consist of advanced test chambers during Portal 2's development, months before the game was released. However, this was scrapped and was removed from the final game. The Peer Review DLC to Portal 2 instead adds only challenge modes to single-player and co-op, with no sign of advanced test chambers. The Art Therapy course is referred to as an additional course instead of the "sixth course". All owners of the PS3 DLC "Portal 2 In Motion" received this course for free. It makes use of the new Portal Surfing mechanic. This page was last modified on 4 November 2017, at 15:37.